As I was writing in my journal a few days back, I used a cliché turn of phrase and found myself musing upon it. * I try to avoid cliché in my own writing; years of formal training as a writer and as a teacher of writing have made such avoidance as much as reflexive. When I do invoke one, it is almost always either obliquely or ironically, almost never in the manner intended–if intent can be said to matter in such cases. But, as I’ve looked at it and at the surrounding world, the thought occurred to me that the ingrained avoidance of cliché is not necessarily a good thing. That is, it seems to me to emerge from unpleasant places and to perpetuate unpleasantnesses in ways that should themselves be avoided. And if that is the case, then I am once again complicit in structures of power and oppression that it were better I not partake in. Source in the image, of course, and used for commentary. Go check it out. There are some reasons to avoid clichés, of course. Cross-comprehensibility comes to mind as one major example of them. Cliché is dependent on cultural context for its meaning and effect; such phrases as “Pardon my French” only work for communities that associate French with obscenity. No small amount of the writing that gets done is done for an audience that cannot be assumed to share the cultural backgrounds of the writer; certainly, no small amount of the teaching of writing (particularly business and technical writing) is done with an eye towards audiences of differing backgrounds. Reducing the burdens placed upon such readers is cited as desirable, and reducing the presence of cliché in the writing lowers such burdens. As I think on the matter, however, it seems to me that the push to avoid cliché has substantially classist overtones. That is, the straight-ahead use of cliché tends to be associated with presumably less refined, less educated people; it is associated with lower socioeconomic strata, while its avoidance and rejection are both coupled to formal education and the concomitant association with either wealth or aspirations to wealth. 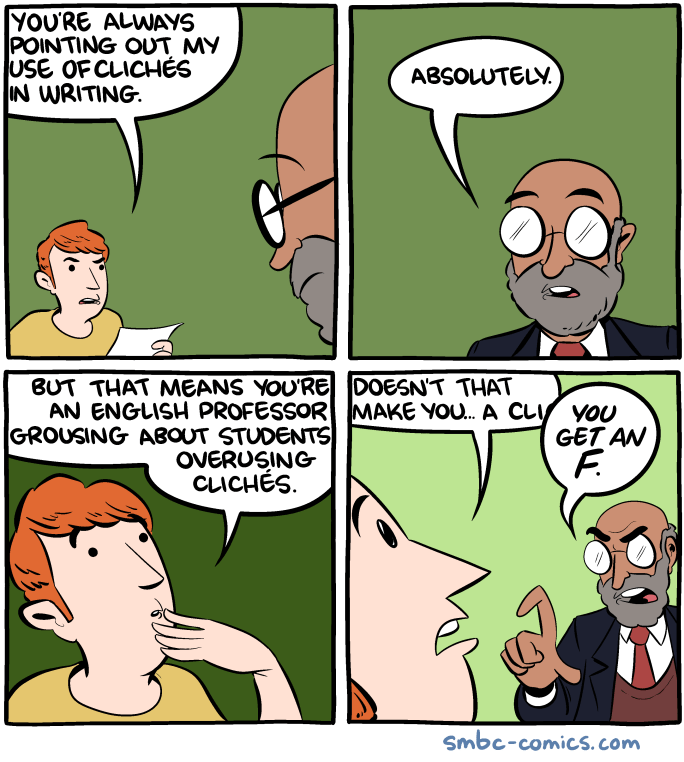 In effect, cliché is a “lower” class thing; its lack is an “upper” class thing. Typical regard bears out the idea; cliché is described in such terms as “phrasing that has been stripped of meaning from overuse,” making it a tired hand-me-down that is ultimately empty. It is decried as intellectual laziness, as trying to sound good without offering substance. And such regard, such construction, such opinion introduces problems to the typical teaching thrust of eliminating clichés, such that noting valid reasons such as cross-comprehensibility read too easily as justification after the fact for oppressive practices. Cliché becomes particularly fraught when viewed as socioeconomic acculturation. By denying writers the use of cliché, we (however collective the “we” can be) deny them self-identification as members of particular communities (with the communities varying by the cliché used, of course) and insist upon particular markers of identification that may well not be those to which the writers may hold for themselves. They become effacements of smaller cultural groups that are in most cases disadvantaged in one way or another. It is not to be wondered at, then, that people coming from those groups chafe under such restrictions and lash out against those who would impose them–and they are not wrong to do so. Yet, again, there are reasons to avoid cliché, reasons to which instructors have to be able to respond authentically and without the appearance of papering over problems instead of addressing them directly. How to strike the necessary balance is not at all clear. And I expect that no few will think either that I am overstating the case by linking cliché to cultural practice or that such cultures as are associated with use of or reliance upon cliché deserve to be oppressed, somehow. To the latter, I have nothing to say that I care to put into this piece; I have many words for it, but most of them are more obscene than even French would admit of. To the former, though, I might say that oppression comes in many forms, not all of which are overt; indeed, the smaller, more covert forms are more pervasive, harder to resist because they are less obvious and, in many cases, more deeply ingrained. Years of teaching conducted by many teachers makes it easy to think that “it’s just the way it is,” as has been seen and actively opposed in other cases. Though the way is not clear, it should be opposed in this case, too. *I find myself in mind of Cathryn Molloy’s 2010 College English article “The Malcliché: An Argument for an Unlikely Episteme.” It’s been a while since I read it, and I’ve not refreshed myself upon it in writing the present piece, but I have the sneaking suspicion that it is relevant. Back to text. Help me steer clear of what I need to avoid!